Part of the writing staff of The Simpsons in 1992. Back row, left to right: Mike Mendel, Colin ABV Lewis (partial), Jeff Goldstein, Al Jean (partial), Conan O'Brien, Bill Oakley, Josh Weinstein, Mike Reiss, Ken Tsumara, George Meyer, John Swartzwelder, Jon Vitti (partial), CJ Gibson and David M. Stern. Front row, left to right: Dee Capelli, Lona Williams and Unknown. The following is a list of writers who have worked on the Fox animated television series The Simpsons in the order of first credited episode (by broadcast). As of April 7, 2019, 137 people have been credited with writing or co-writing at least one episode of The Simpsons. 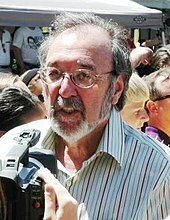 Although series developer James L. Brooks has never been credited with writing an episode of the television series, he did co-write The Simpsons Movie and the theatrical short The Longest Daycare. 1995–2000, 2003–05, 2010, 2014–15, 2017 7–11, 14–15, 17, 21, 25, 27–28 Includes four co-written with Allen Glazier, one with Donick Cary and one with Matt Selman. The hour-long episode "The Great Phatsby" is counted as two episodes. 2000–10, 2013 12–21, 25 Includes nine co-written with John Frink and two with Mitchell H. Glazer. Died 2013. 2002–10, 2014, 2018 14–18, 20–22, 25, 29 Died 2016. 2011 22 Co-written with Peter Gaffney. Died 2014.